On a typical day in Colorado, Torrey Grey is shooting another one of her popular fashion videos. When she asks her sister, MIranda, to film her, she runs away and Miranda was run over by a drunk driver while crossing the crosswalk. 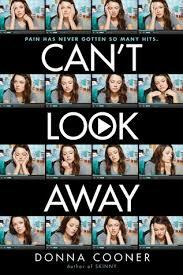 The book Can’t Look Away by Donna Cooner follows Torrey Grey as she tries to deal with her sister’s death and her fans online. On the internet, Torrey is famous for her popular teen beauty videos. Now, with her sister’s death lingering in her mind, random strangers are bashing Torrey saying that she is using her sister’s death as a way to gain popularity.To add on to that, Torrey is being forced to move to Texas to live near the cemetry that her sister and the rest of the Grey family has been buried in. She must start a new school, where she knows no one except for her not-so-popular cousin Raylene. She meets Luis, who tells her about how people mourn younger children during Day of the Dead. As the Day of the Dead comes near Torrey must figure out how to turn off the camera and “learn to mourn her sister out of the public eye”. Donna Cooner has written a touching novel, with a highly relatable main character. Many people can relate to Torrey because she is dealing with trying to be friends with the “popular” girls, or just being friends with people that she actually likes. Donna Cooner made Torrey’s pain seem so real that I was grieving about Miranda along with her. I recommend this book to readers who are looking for an emotional story with a hint of romance, or readers who are simply looking for a quick read.